The name Herdwick is derived from an old Norse word that means sheep pasture. It is believed that the ancestors of Herdwick sheep were introduced by early Norse settlers. Herdwick sheep are considered the most hardy of British hill sheep. They are raised mostly in the central and western dales of the Lake District and are noted for their foraging ability in rough terrain. They produce a good crossbred lamb, but their wool is considered to be of low quality and low value. The produce a coarse, grey wool, a carpet wool. Herdwick sheep are the native breed of the central and western Lake District and live on the highest of England’s mountains. They are extremely hardy and are managed in the traditional way on the Lake District fells that have been their home for generations. The word “Herdwyck”, meaning sheep pasture, is recorded in documents going back to the 12th century. Herdwick sheep are the most hardy of all Britain’s breeds of hill sheep, grazing the central and western dales of the Lake District with fells running to over 3000 feet. Herdwick farms have typically less than 100 acres of lower, more productive land and rely on the common grazings of the high Lake District fells. The lambs graze with their mothers on the “heaf” belonging to that farm instilling a life long knowledge of where on the fell they should be grazing. This is crucial as the central Lake District fells are inaccessible and a sheep which strays from Borrowdale to Eskdale will involve a 100 mile round trip by road for the farmer to collect it. The Herdwick’s hardiness and ability to graze over a wide area of fell is key to the maintenance of the Lake District landscape as we know it. By purchasing Herdwick products you are giving the farmers that manage this candidate World Heritage Site a sustainable future. 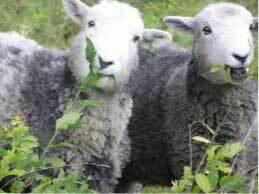 Herdwick sheep are widely considered to be the most hardy of all Britain’s breeds of hill sheep. Probably 99 per cent of Herdwick sheep are kept in commercial flocks in the central and western dales of the Lake District. These fells run to over three thousand feet and facing the westerly rain bearing winds they record the country’s highest rainfall. Herdwicks have a well-justified reputation for foraging ability even in the most difficult terrain. Many of them live their lives without receiving any supplementary feed. Typically they are drafted from the hill after three or four lambings when they often prove capable of producing several further crops of lambs. Although under fell conditions they usually have a lambing percentage of less than 100 per cent this is largely a feature of the nutritional state they live in on the fells. When they are drafted to the lowlands their productivity increases markedly and they perform at least as well as other hill breeds. Given the breed’s allegedly low quality and low value wool it is not surprising that there has been a tendency to breed for a tight and short fleece, although some breeders still prefer a longer and lighter coloured wool. There seems to be no significant difference between the performance of either type. One fact about the Herdwick fleece is that Herdwicks do dry out quicker than other breeds after rain. The fleece is very coarse. It’s heavy and dense with an undercoat. The normal short staple tendency often makes it seem like there is a break in the fleece when in fact, that is the undercoat showing through. Kemp is very common. Most often used for rugs, heavy wool blankets, and heavy tweeds outerwear, I would not consider it next to skin soft though Beatrix Potter loved her suits made from Herdwick and the textiles made from it wear long and hard. Colors range from Chocolate and black to white – and should look like they have been frosted with ice on the face and legs.